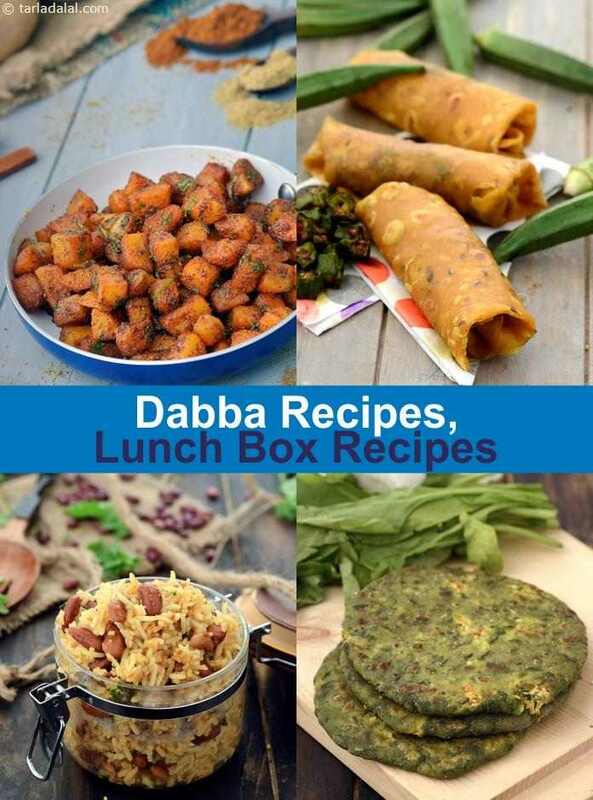 In most Indian languages, dabba typically means box or tiffin box. In colloquial usage, it refers to food that is carried from home to school or work, to be eaten after a few hours at lunch time. The dabba is usually some kind of air-tight container that does not dry up or leak the contents and keeps it relatively fresh. The dabba network that works in Mumbai is well-known all over the world, and is the subject of several management case studies! In Mumbai, there are dabbawallahs who collect food packed in tiffin dabbas from people’s homes and deliver it to their offices close to lunch time. However, not everybody avails of this service in the city, and people in other cities and towns have no such facilities, so it becomes necessary to pack their food in the morning and take it along when they leave their homes. Food that is packed in the dabba has to be such that it remains good even after a few hours. So, people are always wondering what to pack! There are some time-tested dishes like rice preparations and chapattis and many people stick to this. They are afraid to experiment for the fear that the food might not be good in the afternoon. However, there are many dishes that can be packed in the tiffin dabba, ranging from pastas to pulaos and parathas too. You just need to know the trick of how to prepare and pack them. This is a basic dabba recipe that is enjoyed by one and all. When making the subzi, you should make the gravy a little thick and not watery, to avoid leakage. Stuffed parathas are self-sufficient because of the flavourful fillings, so when you pack these you do not have to bother too much about accompaniments. Just some chutney, curds, raita or ketchup can be packed in a separate container. The parathas should be totally cooled after cooking and wrapped in aluminium foils or banana leaves and then packed in air-tight containers. If your paratha uses aloo, you can boil it the previous night itself and keep it in the fridge. Rice, flavoured with myriad ingredients and masalas, is a time-tested dabba option. It lasts for long, tastes fabulous and it loved by all. If you are in too much of a hurry in the morning, you can boil the rice the previous night itself. Else, you can consider pressure-cooking the rice in the morning. Sandwiches must be made with fresh bread. Avoid using tomatoes, ketchup and mayonnaise in your sandwich as it will become soggy. You can carry these in a separate box and add before eating. Allow the sandwiches to cool, pack them in aluminium foil or banana leaves and then pack in an airtight container. Wraps are quite convenient, especially if you eat on the go. Just one dish is enough to make a complete meal, and you can consume it anywhere, any time without any fuss. Make sure the rotis used for wraps are soft and the filling inside is not watery or saucy. The dough for the roti can be made the night before to save time in the morning. You will be surprised to know that pastas make good dabba treats! You just need to make them a little saucy so that they don’t become too dry at lunch time. The pastas can be packed in warm containers or hot packs, or you can also use a normal container. Pick quick pasta recipes that require less time and few ingredients so that it will be easy to make in the morning. The first criterion to select a dish for your dabba is that you should like it! Pick the kind of dishes you usually enjoy eating, so you will not mind even if it is not hot. Some offices have fridges and microwave ovens while others do not. You need to decide on your lunch accordingly. For example, if you have a fridge you can take curds along with your parathas, otherwise green chutney will be a better choice. Plan your dabba menu the previous evening itself, so that you can buy the required ingredients and make the necessary preparations to save time in the morning. Here are some recipes that we have tried and tested to ensure that it stays good in the dabba for at least 5 hours. Followed by a yummy pasta recipe that will appeal to the younger generation. That said, there is nothing like the traditional dishes we have grown up eating, such rice and parathas! You do not have to stick to traditional rice recipes. You can mix and match ingredients and come up with your own innovative options too. You can also try making pulao with ingredients like vermicelli or broken wheat. Go for some scrumptious stuffed parathas or wraps, which are packed with flavourful and multi-textured fillings. These are self-contained and do not require elaborate accompaniments. Once you get out of your comfort zone and start making different varieties of foods for your dabba, you will eventually understand all the tricks of preparing and packing food. Over time, you will start coming up with your own innovative dishes by experimenting with different combinations of ingredients and spices. Eating home food is always better than buying or ordering food from outside, which you can do once in a while for fun but not all the time. As you start exploring the world of dabba treats and realise how much variety is there, the urge to eat outside will fade and you will be totally enthusiastic about packing the dabba for yourself and others in your family! You can start with these recipes and discover many more in our website.